Just over a month ago, hundreds of thousands of Catalans joined hands to form a human chain stretching across the region. It was the latest in a series of mass rallies in the prosperous territory that urged a historic break with Spain, and the creation of an independent Catalan state. In the weeks since, attention has shifted from protesters to politicians – and from high-flowing symbolism to worldly demands for cash. On Tuesday, the Catalan government unveiled a 50-page document detailing the region’s grievances against Madrid. It included an estimate of the financial claims that Catalonia says it has against Spain after years of alleged under-investment and over-taxation: €9.4bn. The two events neatly capture the two faces of Catalan politics today: on the one hand, more and more Catalans want to live in a state of their own. It is a desire that is rooted in their understanding of history, and grounded in language, culture and a genuine sense of nationhood. And it is, most probably, a desire that cannot be stilled through financial concessions or the promise of greater autonomy within Spain. On the other, there is a large number of Catalans who dislike the status quo but who remain reluctant to break with Spain. They resent the way that regional tax revenues are carved up, and worry about recent moves by Madrid to curtail the use of Catalan in state schools. Their grievances may be hard to resolve, especially at a time when Spain is still struggling to emerge from a deep recession. But their demands ultimately boil down to money and legal guarantees. They simply want a better deal. 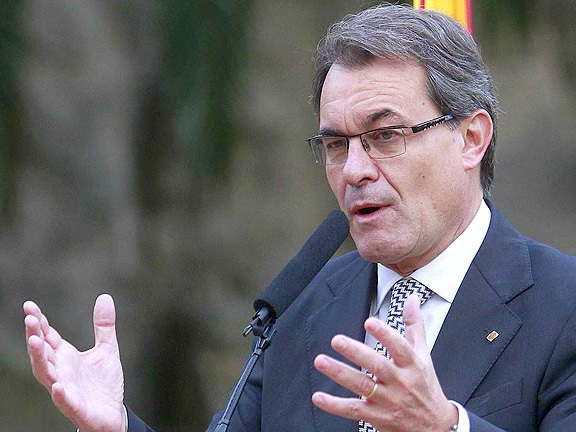 The man navigating between these two camps is Artur Mas, the Catalan president. He has offered strong backing to the pro-independence rallies, and has vowed to hold a referendum on the future status of Catalonia (which Madrid says is illegal). Mr Mas currently governs with the support of the separatist, leftwing Esquerra Republicana movement – an alliance that has nudged him further still towards a pro-independence stance.